Google Docs allows users to create documents, spreadsheets, presentations, and forms that are stored online and accessible from any computer. Google Docs can help you streamline and organize your tasks and responsibilities. By implementing Google Docs, you will see a direct increase in your productivity and a decrease in your stress level. All the Google tools are free and technophobe friendly. Need a Google Account? Please create one! * Please see the bottom of this document for attribution information and links. Welcome to the World of Google! Click here for Example Doc! Click here for example Spreadsheet! Drawings (These are also included in Google Docs, but we won't cover this). Using a form to collect data, administer surveys, score rubrics, or conduct walk-throughs. In a small group, create a document, presentation, or spreadsheet to illustrate your answer. Your Try to think of at least 5 ways you could use these tools in the next 6 months! Share the file (doc, presentation, or spreadsheet) with your whole team. Using a presentation for presenting data. Using a spreadsheet for sharing and analyzing grades. Activity 2: Forms Fun! Who are We? Get into a group of 2 or 3 people. Copy the links to each photo and insert them into your document. Write creative paragraphs to accompany each photograph. Each paragraph should FOLLOW each photo. Add an appropriate title at the top of your document. Change the sharing settings for your story to Public: Anyone with the link. Submit the link using this Google Form. For this task, your objective is create one form that you can implement immediately in your classroom or office to (1) reduce waste (2) save time and (3) collect feedback or information. Select the appropriate question types. Test your form out. Get at least ten people to respond to your form. Mock up something you might actually implement. Add the lead learner (wendygorton@gmail.com) as a collaborator. Revision is a critical piece of the writing process—and of your classroom curriculum. Now, Google Docs has partnered with Weekly Reader’s Writing for Teens magazine to help you teach it in a meaningful and practical way. The sharing features of Google Docs enable you and your students to decide exactly who can access and edit documents. You’ll find that Google Docs helps promote group work and peer editing skills, and that it helps to fulfill the stated goal of The National Council of Teachers of English, which espouses writing as a process and encourages multiple revisions and peer editing. 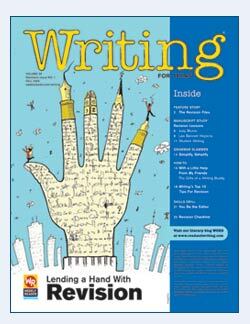 On this page, you will find several reproducible PDF articles from Writing magazine filled with student-friendly tips and techniques for revision. You'll also find a teacher’s guide that provides you with ideas for how to use these materials with Google Docs to create innovative lesson plans about revision for your classroom. 1) Download a step-by-step tutorial [pdf] for Google Docs. 2) Learn about the comments and revision features of Google Docs [pdf]. After reviewing our activity ideas and Google Docs tutorials, you may develop your own lesson plans and ideas. We want to hear from you! We invite you to share your curriculum ideas with the Google Educators community through our Google for Educators Discussion Group. ATTRIBUTION: These resources were adapted from those created for the Google Docs session of the 2010-11-14 Google Workshop for Educators at iNOCAL, Glendale, AZ by Lisa Thumann and Sallie Hill.